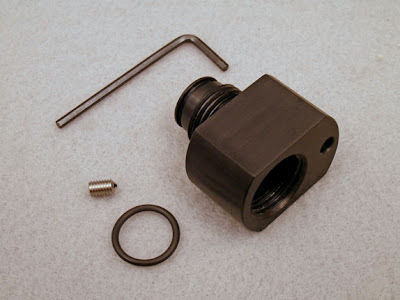 We now have available the Archer Airguns Paintball Tank Adapter for QB79. This new accessory simply screws into the existing thread of your QB79 or AR2079 and provides the necessary clearance to allow the use of any 9-ounce CO2 paintball tank with these air rifles. Over the years, 9-ounce paintball tanks have grown in diameter from 2-inches of older steel tanks to the 2 1/8-inches (or more) of recent alloy tanks. This change in diameter has meant that many 9-ounce tanks will either not fit the QB79 and AR2079 at all, or they will contact the barrel and ruin accuracy. Our new Adapter overcomes this problem, allowing you to use 9-ounce CO2 paintball tanks with your QB79 or AR2079 and achieve over 600 good shots per fill with a gun in factory condition. Beautifully CNC-manufactured from high grade Alumimium, the Paintball Tank Adapter for QB79 is designed to blend well with the design of the air rifle. No parts need to be removed for fitting and it can be clamped into the "vertical" position using the included setscrew. 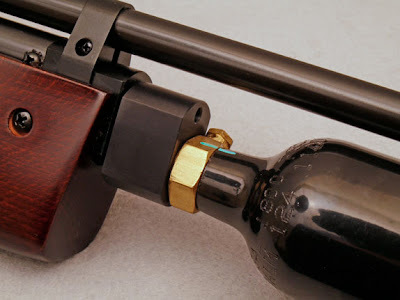 Note that doing so will make a mark in the end of the gun's Tank Block where the screw tip contacts, but this is unlikely to matter as the adapter will probably remain permanently on the gun. 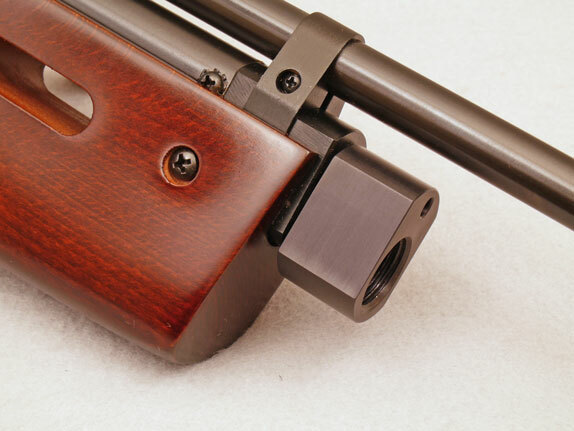 Unlike other previous "fixes" for this problem - such as riser breeches - no parts are removed to fit the adapter and the existing front band remains in place to provide barrel stability. It's easy! I just thought that readers might be interested to see a three-page story about Archer Airguns in the international shooting industry publication Gun Trade World. If you go to the on-line version of the October 2011 issue of the magazine, you'll see our story on pages 42 to 44. 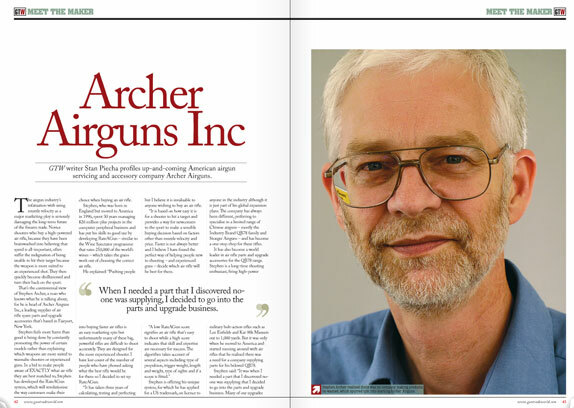 And if you know of an established, quality, dealer who could be a good partner to sell Archer Airguns products in a country outside the US, please email me at sales@archerairguns.com ! Just out of the Archer Airguns QB78 Deluxe Custom Shop is this interesting model, chosen by a customer in California. It combines the Archer Airguns Weaver-style breech with a Stoeger 4 x 32 compact scope, oversize bolt handle and AR2078 thumbhole stock. It's in .177 caliber. Gold Service testing showed performance at around 750 fps at just 62 degrees F. This equates to around 800 fps at 85 degrees F. This was attained by combining an Archer Airguns XP Tune Kit, together with an XP Tuned Valve - together with an HDD to economize on gas consumption. 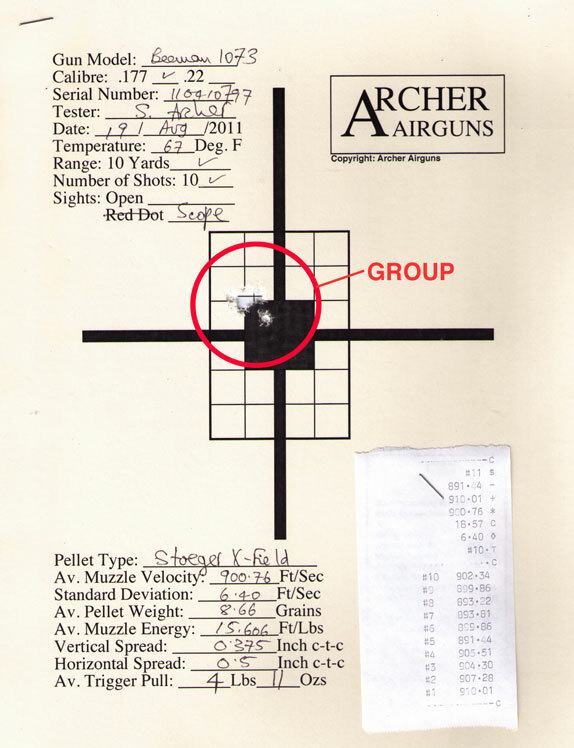 At 10 yards, this gun put three shots through one hole when sighting-in the scope, helped by the Archer Airguns QB78 2-stage trigger kit. Maybe there's some ideas here for your own QB78 Deluxe Custom project! "A couple weeks ago I purchased a TF58 side lever-cocking pellet rifle from ArcherPelletGuns.com. I was pleased with the gun and ran several hundred rounds down range. I own 3 shot guns and two AR-15 platform rifles. The air gun was purchased to shoot with a friend of mine and I was amazed at the accuracy! I bought some Federal bulk 22lr for my S&W M&P15 22 and the air gun was more accurate at 50 yards with this round. That’s impressive in my book. But then I had an accident while loading the air rifle. 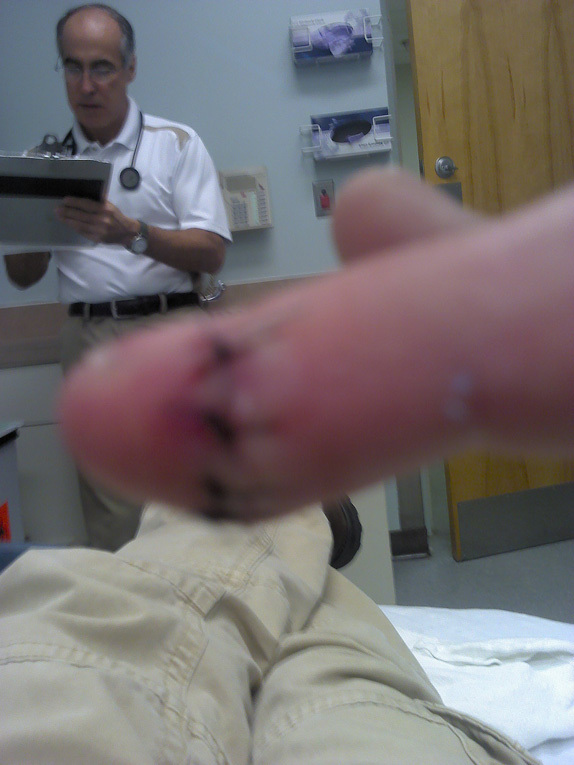 The bolt slammed shut trapping my ring, middle and index fingers in the breech. 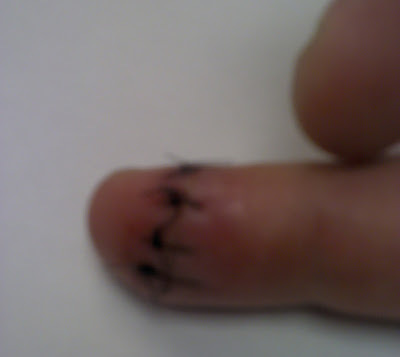 The cut was from the corner of the nail bed at an angle to the back of the finger. I have never thought of myself as a sissy but for the first time in my life I nearly passed out after freeing my finger from the breech! Todd took this photograph in the ER. After cleaning up the blood on the back porch, I tried to recreate what happened in my mind. I had been pretty good about following your safety protocol up to that moment. I don’t think there was a catastrophic failure of the bear trap lock system. Rather I think I became lax in my safety practices after working to get my groups tight and depressed the release while loading and the unlocked bolt slammed shut on my fingers. Fate was with me because without three of them in there I’m sure I would have lost the end of one. Unfortunately I did not have my elbow against the side lever like you advise in your videos on YouTube. I’m not trying to scare anyone and the failure was just a failure. My lax safety was the reason of the injury. 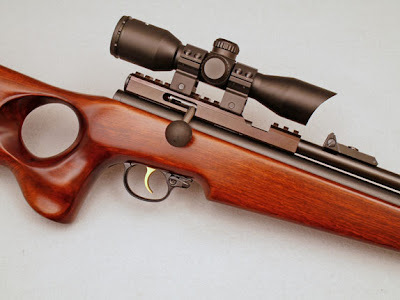 Your informational YouTube videos correctly demonstrate the proper safety practices for loading a side lever air rifle. 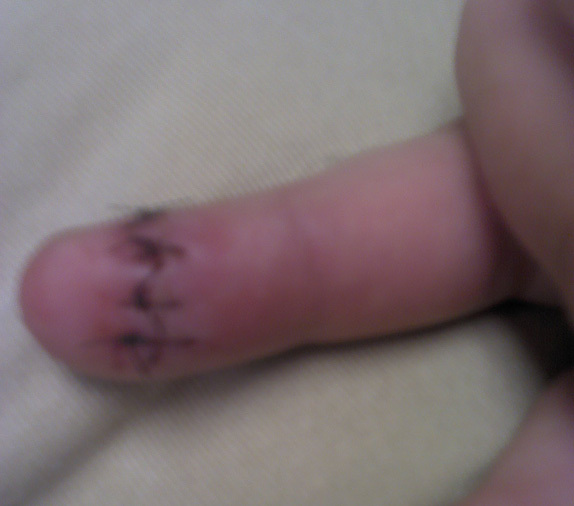 The injury is now healing and the feeling has returned to the end of my finger. I would estimate that approximately 40 % of the diameter was cut through. The doctor didn’t seem very impressed until he pulled it apart to clean and examine the wound. Then he wanted x-rays to determine if it had broken the bone! I look forward to shooting again with much greater respect for pellet rifles! As you know, I’m changing to a break-barrel air rifle and will be sure ALWAYS to follow the safety instructions you show on YouTube. I’m sharing this story to help others. It takes a real man to admit he made a mistake. And even more so to share it with others. Todd, thanks for your post. 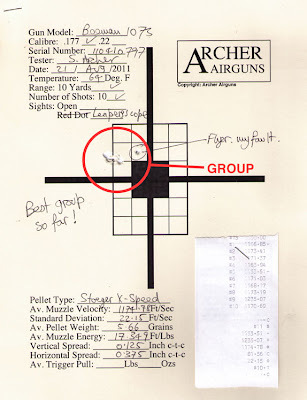 Like you, I hope that people will read this and always load their air rifles safely.